Read this Privatoria review to find out why you haven’t seen this VPN service in any top VPN charts. In this special Privatoria review, we’ll take a look at how this VPN service tries to offer users a low-cost VPN service. This VPN service provider operates out of the Czech Republic and tries to set itself apart from other VPN service providers by offering several interesting features (bells and whistles mostly) without any extra charge. From an overall perspective, this VPN service has a cool looking Android app. Privatoria, for better or worse, does not keep any logs. In most cases, that is a good sign that a VPN service takes care of issues such as privacy and anonymity for its customers. But Privatoria also comes with some huge negatives such as abysmal VPN server speeds and confusing official website. Hence, it really makes it hard for reviewers like Security Gladiators to recommend it as a good VPN service provider. Privatoria bucks the trend in the VPN industry by not offering any single-month packages. At the bare minimum, users have to sign up with the company for three months. But that isn’t always bad news. Because VPN service providers usually offer great discounts when users sign up with them for longer periods of time. And that’s exactly what privatoria does. Users who sign up with the VPN service provider for a period of three months, only have to pay $12.99. Some would call it a very user-friendly price. On a monthly basis, that $12.99 price comes to around $4.33 per month. There are cheaper VPN service providers in the market today, but the price of $4.33 per month isn’t going to break anyone’s bank. Users who are ready to go the distance with Privatoria by signing up for the annual plan can leverage even greater discounts. Privatoria offers its VPN service for just $2.74 per month (which is ludicrous) if the user signs up for a period of 12 months. However, since there are a lot of “pretenders” in the VPN industry, most online users are wary of investing their hard-earned money for a period of three months on a VPN service that they have never tried before. For that kind of users, Privatoria offers a one-hour package as well. The one-hour package will obviously take care of all worries that users might have about the authenticity of Privatoria as a VPN service. The one-hour package is actually a free trial. You don’t have to pay the company anything if you want to use their service for a period of one-hour. Moreover, Privatoria doesn’t require any payment details for users who want to benefit themselves via the free trial. Privatoria has a second free trial offer as well. This second free trial package, again, costs nothing. And users can utilize Privatoria for an unlimited amount for a period of seven days. In other words, you get a seven-day free trial for no money and without any restrictions. But, for this second free trial package, you have to provide the company with your payment details. The company won’t charge you money though. It will only charge you if your second free trial subscription period expires and you don’t cancel the free trial within the allotted seven day time period. Still not convinced to try out Privatoria? For you, Privatoria also offers a refund facility. Users can ask for their money back even after 30 days. That is, if you subscribe to Privatoria and experience a lot of technical difficulties and if the official Privatoria customer support staff can’t resolve your problem, then you can ask for your money back. Even if you have used the service for a period of 30 days. We will begin the features section with a mention of the VPN servers that the company offers. Privatoria, as a VPN service, offers VPN servers in over 20 countries around the globe. Let’s discuss some of the general features that each user can avail when they subscribe to any Privatoria subscription package. Tor through VPN. This feature comes in addition to the VPN service. And it allows users to use VPN through the Tor network without the need of a separate Tor browser. In other words, Privatoria doesn’t allow any torrenting on its VPN servers. The company specifically prohibits it. That is disappointing, to say the least. As mentioned before, according to official sources, Privatoria does not keep any user logs. But any VPN service provider that claims “zero-log” policy must explain how it manages to offer such a feature. Privatoria doesn’t do a great job of that. And we still don’t know how the company ensures its zero-log policy in the real world. We’re not saying that Privatoria is lying. We’re just saying that it is an open question. Privatoria should clearly mention it on the official website how it enforces a zero-log policy in practice. As the name suggests, this feature allows users to connect to Privatoria VPN service and then to Tor to actually connect to the internet. Of course, it isn’t as great as it sounds. The internet is full of discussions on the positives and negatives of using VPN over Tor. You might want to search for those if you want more information on how VPN over Tor works and all the implications of using such a technology. As far as this Privatoria review goes, we’ll just mention two obvious benefits and downsides. The benefit is that you get to enjoy more security and anonymity. The downside is that VPN services already decrease your internet speed. VPN over Tor will absolutely kill your internet speed. Forget about streaming videos or near-instant page loads when you are using features such as VPN over Tor. As far as the technicalities go, Privatoria achieves its VPN over Tor connection by transparently routing the user’s VPN connection from a uniquely configured VPN server directly to the Tor network. So what’s there to not like about VPN over Tor? Except for the fact that if you desperately want to use Tor through VPN you can always just download the free Tor browser, install it, run it and then connect to a VPN service. The setup we have described above is much better than a user making use of a transparent proxy. Especially the kind of Transparent proxy that Privatoria offers. The first is that Tor encryption is usually performed end-to-end. In other words, from the user’s desktop machine to the Tor servers. Privatoria makes use of the transparent proxy method. This method does not eliminate the possibility of the user’s VPN service provider, such as Privatoria, intercepting the user’s traffic before Tor servers actually have a chance to encrypt the user’s traffic. The second reason is the Tor browser. The Tor browser is a hardened web browser. Normal web browsers offer way better features, but as far as various cyber threats go, they can’t compete with a browser like Tor browser. To put it in simple words, users are much better off if they use Tor browser after they have connected to a VPN server via their VPN service. Privatoria also offers a Web Proxy Tor feature. This feature is very similar to the VPN over Tor feature. Except that it uses an HTTP proxy instead of a VPN connection. As far as VPN protocols go Privatoria offers OpenVPN and L2TP. If you have read any of our reviews you would know that our recommendation is always OpenVPN. It is an industry standard, in other words. OpenVPN basically uses AES 128-bit cipher as the mainstay of its encryption method and combines that with RSA 4096 bit handshake. It also uses HMAC SHA-1 for data authentication. The more common encryption technology is AES 256-bit. But that doesn’t mean it is any better than AES 128-bit. Almost all security experts consider AES 128-bit as the best as far as security is concerned. So why would you want to use an even stronger AES 256-bit since it would consume more processor resources? Moreover, the other thing we have to take into consideration is the fact that AES 128-bit uses a stronger key schedule when compared to AES 256-bit. There are security experts, though in the minority, who argue that AES 128-bit is actually more secure than AES 256-bit encryption technology. Privatoria doesn’t specify any Diffie-Hellman Keys in its OpenVPN configuration file. If you ask Privatoria about this, they will assure you that they do support Perfect Forward Secrecy. HMAC SHA-1 authentication is a pretty fine method. But even then, Privatoria has plans to actually transition to HMAC SHA 256-bit very soon. As far as the RSA 4096-bit handshake is concerned, it is an excellent choice. The internet has a ton of guides on how to understand OpenVPN encryption and all the terms that we have used so far. Due to the format of our Privatoria review, we can’t realistically explain them all here. However, if you must, then understand that Privatoria uses a very good OpenVPN encryption suite. It does quite well on the privacy front as well. The company specifically mentions on its official website that it does not keep any logs on its user activity. As mentioned before, the company operates out of the Czech Republic. And according to OpenDemocracy, this allows Privatoria to access many benefits. OpenDemocracy says that the Czech Republic state doesn’t really have the facility nor the capacity to develop any kind of mass scale internet surveillance programme. It also mentions on its site that because of that fact the Czech Republic has to resort to other surveillance methods which are pretty old school. As far as any VPN user is concerned, what they need to understand is that the Czech Republic doesn’t have to bow down to any mandatory data retention laws. They also have no known special arrangements with organizations such as the NSA and/or GCHQ. A country having no ties to organizations like NSA is a blessing for VPN service providers. Privatoria allows users to buy their subscription packages via Bitcoin. And that provides a further shield of privacy. On the face of it, the website does look rather good. It is also surprisingly easy to navigate. The Privatoria official website has a decent FAQ section which does a good job of covering some of the most basic user questions. Of course, Privatoria could take that to the next level and answer questions with more detail. The company also needs to add a bit more information about the service itself on its help pages. Privatoria also has an official blog. The company has published many feature-length articles on it as well. These articles touch on topics such as setup guides and others. Since these are highly relevant to Privatoria itself, you won’t find these anywhere else on the official website. Privatoria offers live chat support for all its users. Users can only avail the live chat support during office hours that correspond to central European regions. Our research shows you should expect a quick response from the Privatoria customer support staff. Also, expect them to have a friendly tone while answering your questions. From the responses, we are more inclined to believe that they are eager to help their customers. However, as far as the in-depth technical knowledge of the company’s front-line customer support staff is concerned, it is a bit thin. They will refer more difficult questions to their technical team though. Hence, Privatoria staff should have no problems in answering all your questions within a matter of minutes. If you can’t catch the live chat support during Czech office hours, then you’ll have to use the ticket email system. The company guarantees that it would respond to all queries within 48 hours. To start the sign-up process, users have to provide Privatoria with a valid email address and a username. The company will itself provide the user with the password. But if the user so chooses then he/she can pick a new one of his/her own preference. The setup is a secure one. All that means is that the email address that the user provides to the company at the start of the sign-up process doesn’t have to be valid. And that is undoubtedly great for people who are ultra concerned about their privacy. As mentioned in previous sections, if you sign up for the first time for just an hour with Privatoria, you can do so without providing them with any payment details. But one hour isn’t a long period of time in anyone’s book. It may prove enough for some to test out the VPN service though. If you think you need more time then you can go for the second option which we have already discussed before. That is, the second free trial. The second tree trial will last you a good seven days. But you will have to provide the company with your payment details in order to avail the offer. Or should we say a lack of Windows VPN client? Privatoria does offer setup guides for users to configure L2TP/IPSec by using the Windows built-in VPN client. It also provides users with more guides for setting up their VPN service by configuring OpenVPN. Users who want to use the OpenVPN protocol will have to do so via the official OpenVPN VPN client. Go here to know more about that. The concerning part, at least in the beginning, had to do with the official OpenVPN client. It is a robust piece of software application. But in a lot of ways, it isn’t as good as what some of the best VPN service providers offer. What we are pointing towards here is the fact that OpenVPN, initially, did not offer any kind of IPv6 and/or IPv4 DNS leak protection. Of course, OpenVPN has listened to the complaints. And starting from version 2.3.9, the OpenVPN VPN client does have that protection. There is one other slightly annoying problem though. When users try to download .ovpn config files, each of them come under the same name. That causes a problem when you a lot of them. And the only way to get around this problem is to rename those files manually to some other name that is more useful. The OpenVPN client is free. Hence, users can’t really complain about OpenVPN client not coming with any of the fancy bells and whistles that you would normally find in dedicated VPN apps. The one feature we think no one can live without as far as a VPN service goes is the kill switch. Apart from that, some users will find it slightly harder to actually set up OpenVPN client when compared with some of the other custom-built VPN clients. In the end, though, it is good enough to do its job. Can’t complain about free or can we? Now, the thing you need to understand here is that the speed results of any VPN service provider are fairly variable. It is inherently an unstable place. Add to that the fact that your VPN service provider can’t do anything about the quality and speed of your internet connection. Hence, your results will vary from a person who is using a 2 Mbps or 100 Mbps internet connection. Practically though, all VPN service providers decrease your internet speed to some extent. The good VPN service providers though, decrease your internet connection speed to a lesser extent than the average VPN service providers. And that is what we are going to find out in this section. By how much does Privatoria degrade your internet connection speed? All you have to do is to perform the test several times. And for several different locations. Then you need to average them out. Compare all the results with the results that you get without the use of a VPN service. The difference between the two speeds should give you an idea of how much a VPN service is degrading your connection. Our research shows that Privatoria will offer you terrible speeds. But it will protect you against IP leaks. It will also block WebRTC leaks from the server-side. Users whose internet service providers don’t support IPv6 don’t have to worry about IPv6 leaks. However, OpenVPN changelog does say that they have started to offer IPv6 leak protection as well. What you really mean to ask is that does Privatoria work with US Netflix?. At least that is what our research goes. If you connect to a US server via Privatoria, you won’t have access to US Netflix. But it will work with BBC iPlayer if you connect to a VPN server located in the UK. As mentioned earlier as well, Privatoria does provide users with L2TP/IPsec setup guides. If we’re talking about OpenVPN setup guides, then Privatoria only provides them for Windows and Linux. For the Linux guide, you will have to know how to work around a command line. Privatoria also supplies OpenVPN configuration files for platforms such as Mac OS X/Linux and Windows. Users who want to use Privatoria on any other platform shouldn’t face problems as long as the system supports OpenVPN VPN client. There are also manuals available in the exclusive member’s area of the official website. As pointed out earlier, the official blog also contains additional Privatoria setup guides. These include guides on topics such as how to set up Privatoria via OpenVPN on Mac OSX by only using the Viscosity VPN client. Privatoria VPN service doesn’t furnish users with any custom desktop VPN client. But it does so on the Android platform with an official Android app. The Privatoria Android app isn’t just a VPN client. It also includes many other features such as secure chat client. 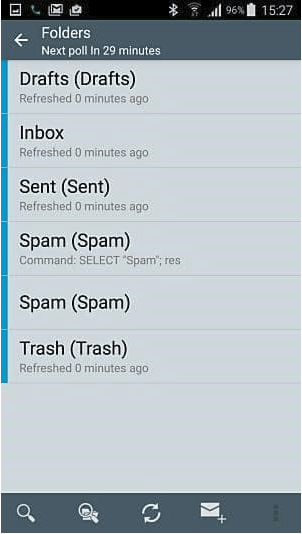 The Privatoria Android app also supplies users with an email client which they can use for the company’s Anonymous Email service. We’ll talk more about both these extra features in the coming sections. For now, it should suffice users to know that the Privatoria Android app will not cost them anything. Users do have to create an account if they want to use the Android app though. And this account is in addition to the one that they made with privatoria while signing up for the service via the official website. The Android app does include a feature called Privatoria VPN + Tor. But despite that name, the Privatoria Android app doesn’t have any meaningful Tor functionality. The one cool thing about the Android app is that it allows users access to the company’s Anonymous Email account. Users should know that even though the company calls it an Anonymous Email service it doesn’t support PGP via the app. The desktop version of Privatoria Anonymous Email service does have PGP. What about the secure chat feature? It is one of those groovy features that users can use with any of their colleagues and/or friends who also happen to use Privatoria. Of course, you can go for better options such as Signal which is more secure than any of the Privatoria’s offerings. If you want to know more about Signal then it is best to search for Moxie Marlinspike via a search engine. Let’s get over with the nit-pickings. Let’s just say that the Privatoria Android app is a reasonably well-built app. It has a smart look and works as it is supposed to work. Our research shows that the Privatoria Android app should protect users against WebRTC and DNS leaks. There are a lot of things you can say about the Privatoria anonymous proxy service. And the first of those is that it isn’t really anonymous. It is basically an HTTPS-encrypted HTTP proxy. The company offers users more than 15 locations via this service. And just like a VPN service, this proxy service will hide the user’s original IP address. As a result of that, websites around the web wouldn’t know your real location. 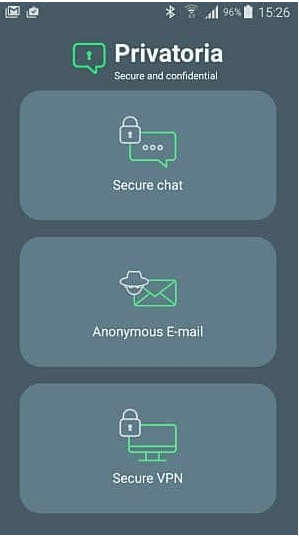 This “anonymous proxy” service comes with HTTPS connections and hence it can also ensure that your internet service provider can’t monitor what you are doing on the internet. The problem with this service is that the entity that runs and controls the proxy server can actually monitor the user’s internet activity. In this case, that entity is Privatoria. Hence, this anonymous proxy service is hardly an anonymous proxy service. Privatoria also offers a proxy browser plugin. Users have the opportunity to download it for web browsers such as Opera and Chrome. Our research shows that if you use the anonymous proxy browser plugin, it should protect you against any DNS leaks. Don’t expect to have WebRTC protection though. That means you could accidentally reveal your true IP address while connected to this service. And no, it won’t unblock US Netflix. Our research also shows that this plugin will allow you to watch BBC iPlayer with ease. To know what is the difference between a VPN service and a Proxy service you will have to turn to your trusty search engine again. There you can read a full discussion about proxies and VPNs and their differences. The thing about proxy services is that most VPN service users don’t really need them. But some users would still find a use for proxy services. Privatoria can confirm that the company has a plan to introduce SOCKS proxies in the very near future also. The Privatoria anonymous email service has actually got its very own email server (POP3/IMAP). The Privatoria HTTPS connection encrypts all outgoing and incoming emails. Privatoria stores all of these messages on the company’s servers by default. It uses AES 256-bit encryption to secure these messages. Privatoria performs this encryption by itself. This setup ensures that hackers can’t access user emails. If law enforcement agencies come knocking on their doors, Privatoria can and probably will cooperate with them. Of course, they have to follow all the legal matters in their country of operation. But that isn’t great as far as user privacy and anonymity is concerned. As mentioned earlier as well, the best news about this anonymous email service is that Privatoria supports end-to-end PGP encryption. PGP encryption is extremely secure. With that said, we also have to mention here that even though it uses PGP, the metadata related to any message header is still quite visible. But Privatoria anonymous email service does enough to ensure that there is no user except the intended recipient and the sender who can read their communications. Or even view attachments that come with their email messages. Now, even though PGP is very secure, it is still very complicated to set up. The process is quite involved. Privatoria, on the other hand, has done its best to make the process as painless as it can get. In fact, Privatoria has furnished users with a PGP encryption manual. Users can access that via their control panel. All of this is pretty awesome when it comes to security. Users should keep in mind though that PGP only works if both sides of any communication channel use it. Otherwise, it doesn’t really work. The company does not keep logs. But it doesn’t really make it clear how it does that. VPN over Tor is meaningless when users can use the official Tor Browser while they connect to a VPN server. There is a lot to recommend about this VPN service. The important thing you need to know about Privatoria is that it doesn’t keep any logs. At least officially it doesn’t. And it is very cheap if you sign up for longer periods. The company also has a dedicated and custom Android app. It doesn’t offer any custom software for desktop platforms though. For those platforms, you will have to use the official OpenVPN VPN client. As far as the Windows platform is concerned, OpenVPN client will protect you against IP leaks, so that is a plus as well. Our research shows that the Privatoria’s OpenVPN encryption implementation is good. The Android app itself looks and feels very nifty. And there are many extra features as well. Although some of these extra features won’t prove as useful to many users. From an overall perspective, users can easily find better services out there in the market which perform better than Privatoria and that too for free. Take a look at Privatoria’s VPN over Tor feature. Most users don’t need it. You can just use the Tor browser while you are connected to the internet via your VPN service provider and that would prove much more secure than the Privatoria VPN over Tor setup. Not to mention, it is much simpler to use the Tor browser. So what’s the fly in the ointment that we haven’t talked about in this summary? Privatoria is a slow VPN service. And that basically is enough to put down even the most accomplished of VPN service providers. The speed that Privatoria provides its customers via its VPN servers is actually terrible. It is so slow that it makes Privatoria all but unusable. Hence you should stay away from it. And sign up for a good VPN service provider such as IPVanish and NordVPN. The official Privatoria website is no longer showing any subscription packages. But that may change. We’ll update this post as necessary. Privatoria has a number of things going for it. One of them is its subscription pricing model. It is cheap. The company doesn't keep logs and offers a dedicated Android app. No such luck for desktop users though. Privatoria has done a good job of integrating its service with the OpenVPN client. But since it is a paid VPN service and comes with slow VPN server speeds, it simply doesn't have much to offer when pitted against some of the best VPN service providers in the market today. are any of their servers even working anymore? It seems like there is something wrong with their service at the moment. Right now, we can’t buy a new package from their official website because it isn’t working. We’ll update the review once we get some information about what’s going on with Privatoria. website not working for >1 month. i can still connect to a couple of servers but i would avoid like the plague – cannot login to web panel to get new configs and site completely broken. Thank you for your feedback Leone. We’ll update the review as soon as we hear back from Privatoria as to why their website is not working and why can’t users connect to more servers.